I started to follow the crop circle story very closely in 1990. I have a number of books on the subject and many journals and newsletters. The two major journals are The Cerealogist and The Circular. I began to see number connections early-on. I read Joseph Campbell's The Inner Reaches of Outer Space in late 1990. In a part of the book, he wrote about ancient numbers, such as 108 and 432. He pointed out how the numbers always add to nine or a multiple of nine. Similar numbers, I found, were often reported as dimensions of various parts of crop circle formations. The number nine was quite apparent. After learning about Carl Munck's "Code" and the Gematrian numbers in 1994, I became more aware of similar numbers within various crop circle formations. I made contact with Charles Johnson 1996. He is a scholar of ancient numbering systems and has also studied Carl Munck's work. I mentioned the possible crop circle connection to the ancient numbers to Charles, and later sent him a large packet of information about it. We planned to do a joint article about the subject. Unfortunately, other plans took priority, so the project was not completed. On August 1, 1997, I received The Cerealogist #19. On pages 9-13, was an article titled, Prehistoric Mathematics & British Crop Circles. The article was originally published in FGK Report, written by Max Seurig and H. Werner Baumann. It was translated for The Cerealogist by Ute Sayer. I will recount the article here. The two German researchers analyzed prehistoric stone circles and compared the results to other objects in different parts of the world. The objects examined were from 600 BC to 2300 BC. The measurements were in meters. They found a unique order of numbers, which seemed to follow a plan. Equal or related series of numbers were found as azimuth and distance in meters of stone pathways, circumferences of pyramids, the sum of symbols in reliefs, construction features of buildings, etc. From this, Seurig and Baumann developed "Prehistoric Mathematics." The system shows an unusually high mental-theoretical level, the origin of which is unknown. Prehistoric Mathematics contains the four main calculations for the division of 360-degree circles and dissected parts of circles defined by their angles, and for triangles and squares, including their angles. The Pi constant (3.14) is also used. A "cosmic-related world of numbers" developed, which included the Zodiac and planets known in prehistory. Most of the calculations lead to the huge time period of the Platonic Year. 60 ' = 3600 "
Only the duration of Scorpio is identical with the length of the Platonic month. Seurig and Baumann came across such numbers again and again in their research into the constructions of the ancient builders. There are "problems" with figures in this table, such as the figures given for Venus, Mercury, and the sun, but Seurig and Baumann say it is not relevant to their investigations. The numbers were used as ratios in prehistoric astronomy, similar to the numbers of the Zodiac. To their surprise, Seurig and Baumann found similar relationships of numbers in their study of British crop circles. They gave a few examples in the article. This crop circle formation appeared at Etchilhampton Hill, near Devizes, Wiltshire, in 1993. Six circles of almost the same size were arranged around a central seventh circle. Pathways, like spokes on a wheel, connected each of the outer circles to the central circle. The six spokes divided the formation into sectors of 60-degrees each. Thus, three axes are built, each connecting its outer two circles with the central circle. One of the axes ran exactly north-south. round up to 252.00 meters. 2160 / 6 = 360 (360-degrees of the Zodiac). This figure matches the number of years given in the above chart for the Zodiac sign of Virgo (45-degrees x 72 years = 3240 years). Seurig and Baumann found that in the prehistoric system, decimal places and measure dimensions are not relevant. The sequence of numbers, however, is important. For example, the diameter of a circle of 12 meters and the length of a spoke of 9.60 meters, adds to 21.60 meters. It contains the length of a platonic month of 2160 earth years. The circle diameters of 12.00m + 11.00m + 11.30 = 343, indicate an important number in historical development. It is seven cubed, 7 x 7 x 7. It is the opinion of these researchers that a connection exists between measurements of crop circle formations and ancient mathematical-astronomical facts. It becomes more clear when one includes degrees into the calculations. The result shows the known Platonic month or a period of 2160 earth years. The result shows the same sequence of numbers as calculated in meters, but ten times larger. This is again a period of seven time periods of 2160 years each, produced by the number 6 here, whereas the number 60 was included from the measurements to produce the same result in the prior calculation. 1. By creating a picture of seven circles. 2. By calculating on the basis of meters. 3. By calculating the time on the basis of degrees. Analysis of this kind can be used to determine the validity of the prehistoric number system and whether it is indeed being incorporated within the crop circle formations. If it is valid, then it also points toward a view of human development outlined in theosophical and anthroposophical literature. Seurig and Baumann also analyzed the so-called "Comet's Tail" crop formation found in the Wiltshire area in 1994. The formation revealed a similar systematic structure of number, but in a very different methodical variation. A "well spring" with an opening, like a mouthpiece or cornucopia, launches, in an elegant curve, twelve circles and one ring. The ring, furthest way from the mouthpiece, has the largest diameter. The diameters of the next twelve circles gradually decrease, like "soap bubbles." The line of twelve circles is divided into sets of five and seven by slightly bigger gaps between the circles. The calculations start with the smallest circle. The researchers viewed the circles coming out of the "spring" as "time-rings" of a calendar of 12 months. The different ring is not included in the first analysis. The gaps between circles divides the 12 circles into groups of 7 and 5. Such divisions are also found in mythological literature, with a positive and negative valuation: 7 good or bright periods of time are opposite 5 bad or dark ones, caused by the astrological associations. The various measurements or selected combinations are used as part of the calculations, along with the Pi constant. The results lead to the Old Astronomy, in which certain numbers adopt a pilot function. In the case of this crop formation, the gap measurements produced significant additional elements. 1. The basic quantity is the "7" (length of the "spring": 7.00m), which plays an important role in astronomy, astrology and cosmology, as well as in mythology. Taking the set of seven circles, the sum of the diameters is 32.40 meters, or 3240 centimeters. This signals the starsign of Virgo, the first Platonic month, the new year or birthmonth of the Platonic year. 2. The calculation 32:40m x 7.00m results in 226.8m, the sum of the other eleven Platonic months. 32.40 + 226.80 = 259.20 or 3240 + 22680 = 25920, the whole Platonic year. Remember too, the same numbers were found within the Etchilhampton crop circle formation. This results in more numbers of the Platonic year. 12960 contains six Platonic months of 2160 calendar years each, presumably the first half. 15552 - 12960 = 2592, which stands for a Platonic month developing out of 36-degrees x 72, of which there are three: Leo, Taurus and Pisces. This seems to indicate the seventh month of the Platonic year, the starsign Pisces. Currently, the spring equinox is situated in about the third quarter of Pisces. Perhaps the number 15552 indicates the present Zodiac Age. Another solution is possible, and perhaps it is even more valid. As mentioned above, seven Platonic months were grouped as a time cycle in ancient times. Such a period ended dramatically in the starsign of Leo about 10,000 to 8,000 BC. Six time-cycles or Ages totaling 12960 years would contain the Platonic months of Aquarius, Capricorn, Sagittarius, Scorpio, Libra and Virgo. Therefore, the intermediate result in the calculations above, 2592, may indicate the duration in years of the Age of Leo. Perhaps the imperfection is a hint that the cycle of seven has not yet been completed. This serves as a confirmation of the previous figure. The number before the decimal point, 324, suggests the duration of Virgo, 3240 years, and the beginning of the Platonic year. The 0.7 behind the decimal point repeats the seven of the "spring," but in a reverse relationship; here a tenth of 32.40m, and there a tenth of 7.00m. Before the decimal point is factor 10 (32.40 x 10 = 324.00), and behind it is the factor 0.10 (7.00 x 0.10 = 0.70). Up to this point, the time-cycles of the Platonic year were revealed in the calculations. The following calculations show that in this crop formation, ancient numbers associated with the seven planets are revealed. This figure may suggest the ratio of Saturn given earlier, 384 x 27 = 10368, because 12 x 10368 = 124416. Twice 10368 is 20736, the sum of the ratios of the seven planets. The connection with the seven of the "spring" becomes clear. Also significant, the number 124416 contains two numbers than turned up in all the prehistoric places examined by Seurig and Baumann, 144 and 216. Their sum, 360, always represented the 360-degrees of the Zodiac. When a zero is added to each number, the Zodiac connection is clear - 2160 is the basic length of a Platonic month, and 1440 is the duration in earth years of the Platonic month of Cancer, with which the new "seven-cycle" starts. Pull the second 1 and add it to the first, to arrive at 20.736, indicating 20736, the sum of the planet ratios. Again, this figure is the complete length of the platonic year. Adding both results together results in 76.80m, suggesting 768, the ratio of the sun. This draws attention to the ring in the crop formation. It suggests that the ring does not belong to the the twelve circles or calendar of twelve. The calculated value, 768, provides a clue. This 13th object may represent the sun. The central orb of our solar system, the sun, of course, is the main celestial object associated with the Zodiac Ages, acting somewhat like the hand of a giant clock in the heavens, as the solstices and equinoxes very slowly rotate through the starsigns. Seurig and Baumann conclude by saying that the work here is just a beginning. They make clear that this is just one of many possible interpretations. Although they did not use every way of calculating, they created a reasonable time and space frame. It correlates with findings from the study of prehistoric objects, an impressive example being the Boitiner Steintanz in Mecklenburg, Germany. Whoever the makers of the "Comet's Tail" crop formation might have been, the analysis here shows that they knew about Ancient Astronomy. The researchers contemplated the possible meaning of this - the mental background of the astronomical data, what the scientific, artistic, ethical message might be, if one was intended. If the formation was created by hoaxers, an expert must have designed the pattern, because accidental data of this type is not likely. The results of the study have led Seurig and Baumann to suspect the possibility that the crop circle formations are being created by the same intelligent forces that in ancient times inspired the builders of prehistoric stone monuments, in order to prove that they presently want to be effective again, for whatever reason, trusting that we will recognise them by their world of numbers. They ask, "Is the present meant to learn to deal with the ancient and eternally valid laws of the mental cosmos with awe?" They conclude, "Without doubt, it would be highly necessary. So, it is important to examine the phenomenon further, to collect more material, to investigate and prove, and keep this way of interpretation in mind, especially because we found similar results in other crop formations as well." 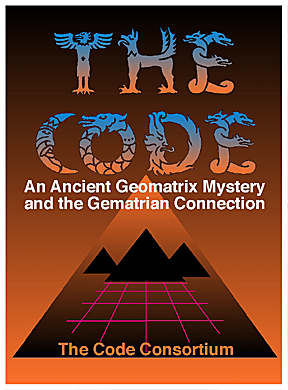 It is our intent to continue exploring the possilbe crop circle connections to Gematria and "The Code." This review of the fine article by Max Seurig and H. Werner Baumann is just a beginning. IS SOUND BEHIND THE CREATION OF CROP CIRCLES? Miami: The home Of The Mayans?